TOTAL MUSIC GEEK by Drew Kerr: Al Kooper -- "(Please Not) One More Time"
Al Kooper -- "(Please Not) One More Time"
When you're the so-called "Zelig of rock and roll," you're entitled to do what you please. Al Kooper can merit many pages of biography -- from the guy who played organ on Bob Dylan's "Like A Rolling Stone" to the man who discovered and produced Lynyrd Skynyrd and The Tubes, and perhaps you know he helped found Blood, Sweat & Tears? That's just the tip of the iceberg. Read his web site's bio and his "selected" discography. Let's turn the dial back to 1977, and Kooper's seventh solo album, Act Like Nothing's Wrong, shows up at the college radio station as well as the school paper's music section. The cover catches my eye because let's face it -- it is damn weird with Kooper's head on a babe's body and the back cover is the reverse. 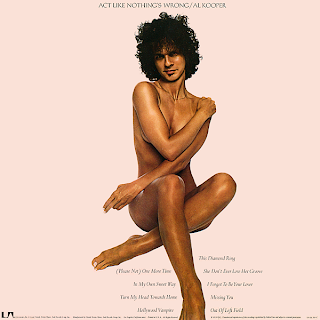 And he is Al Kooper, he's got loads of credentials, and frankly, I didn't know what he sounded like as a solo artist. Open up the record (on the late lamented United Artists label), and the inner sleeve reads: "Dedicated to my influences"followed by a long, long list of rock, pop, and soul artists. Never has a dedication worked so well on double duty describing what the album actually is. Kooper has taken a collection of original and semi-obscure tunes and re-arranged them into the many recognizable styles of popular artists of the 70s. The whole album is a fun game of "spot the artist." His own 60s hit, "This Diamond Ring," is reworked into a minor-key Little Feat funk workout. "Hollywood Vampire" is a paean to the dire L.A. landscape of Joe Walsh and The Eagles, notably the power chords of "Turn To Stone." And yes, that is Mr. Walsh guesting on slide guitar, in case you didn't make the connection. For this post, I came really close to picking "She Don't Ever Lose Her Groove," a bobbing Al Green tribute where Kooper gets all soulful and hot and bothered, the Tower of Power horns doing a perfect mock-up of Willie Mitchell's old arrangements, and a killer fluid guitar solo at the end. We went with the ridiculously catchy "(Please Not) One More Time," which can best be summed up like this: Steely Dan's "My Old School" meets The Beach Boys. Recorded with some of Nashville's finest musicians, Kooper meticulously gets every Fagen and Becker nuance right, with a hefty dose of Brian Wilson: up and down clavinet riff, ascending chord structure, mock horn riffs (including the dead-on break arrangement), and yes, lots and lots of layered Endless Summer-like vocals courtesy of the Ron Hicklin Singers. And instead of tackling the good old days at Bard College, Kooper gets caught in the cross fire of a long-distance relationship between California and Atlanta, GA, along with some double-entendre rumors thrown in (not having the "energy to go down one more time?"). Hey, there can only be one Fagen and Becker. Doesn't matter. Here is the very non-subtle "wear your influences on your sleeves" tune along with a video I created which is as much a tribute to Kooper as it is to the song itself.